MRK: I’m excited about the ways that your marks reference the development of written language. They mimic that sense of grasping for ways of communication that are imperfect yet persistent; I see both the beginning of line and its destruction. Your particular marks additionally lend themselves to meaning as you translate them from a digital world to a human one. Well, those two worlds are really merging these days. Which do you feel more drawn to now that you have completed your work at ICA? AE: Many people see text fragments, of a variety of languages and alphabets, in the work. I don’t deliberately add text fragments. It is merely a byproduct of the process. The forms I use (straight lines, curved lines) is the very stuff of all letter forms. I have always been interested in typography as well as word play, and my early works from 1990-98 utilized text and typography in a very direct way. I love that this has come back into the work through the back door. As for mark-making and gestural image-making, I am drawn to it, fascinated by it, and appreciative of its place within the history of abstract painting. People have gotten lazy about looking at and thinking about gestural abstraction. It’s easy for viewers to focus on the emotive aspects of the work–to regard gesture as merely a record of mood or state of mind, and to be dismissive of that. But all of the great mid-century Abstract Expressionists were dealing with headier issues. Abstraction has been given short shrift lately, even as contemporary abstraction surges in the today’s art market. I am very interested in the current scuffle over “Zombie Abstraction,” which implies, among other things, that artists are merely trying stylistic strategies on for size, untethered to the lengthy, historical, philosophical debates about the intrinsic issues of painting. Remember, Joan Mitchell was wrestling with Cézanne. Bridget Riley was thinking about Seurat. A sense of personal urgency and the impetus to grapple with historical precedents is necessary. The digital (virtual) versus real (human) is such an interesting subject in general, and it greatly informs my work. I want the human aspects to win the battle, but I fear that they won’t, in light of the seductive ease of all things digital. My paintings are very much a process of reifying the digital image. The digital is dead, flat, lightning-fast, facile, endlessly variable. The decision to make a painting based on a flimsy digital file is about commitment, time, labor, effort. So, I translate a sketch I make in an hour or two to a painting that might take 500 hours to complete. I see this dichotomy as a means of furthering the philosophical project of abstract painting. 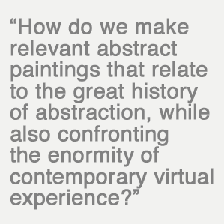 How do we make relevant abstract paintings, now, that relate to the great history of abstraction, while also confronting the enormity of contemporary virtual experience? The digital/virtual is the antithesis of the humanness of painting. I suppose my use of digital tools and imagery is a means of keeping the enemy close. MRK: What role does the transcription of the abstract mark play as you bring the simple abstract lines into complicated physical surfaces in your work? AE: The transcription/translation process is essential to the work. There is an evolution from beginning to end. Things are lost along the way, things are gained. Each shape is rendered in five steps: design, projection, transferring, taping, painting. At each point, minute decisions are made. Each of the thousands of shapes is working hard to assert itself, though many of them are covered up when all is said and done. 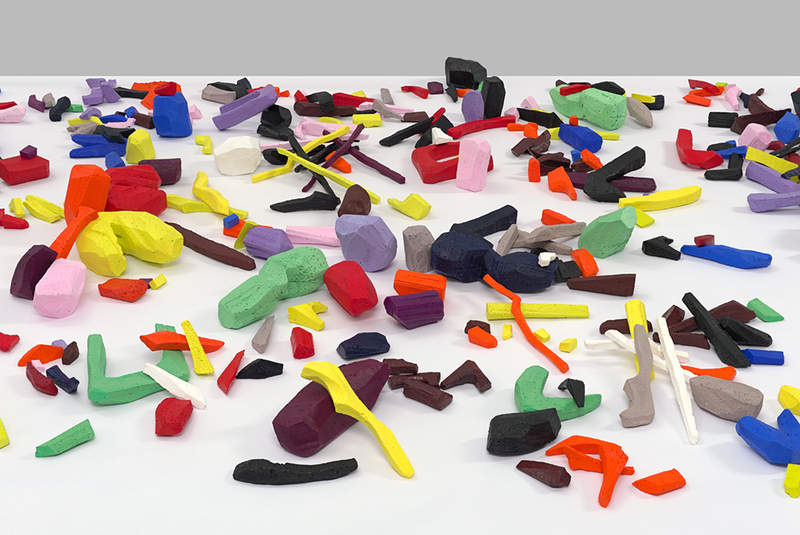 MRK: You have described your 3D forms as “artifacts liberated from the physical plane”. Do you sense a linear progression between the “wireframe interpretation” of the mural grayscale lines, the layered paintings, then the sculptural forms? AE: Absolutely. For the San Jose ICA show, Iterations & Assertions, the diptych, Variation: Apparent Reflectional Symmetry, Parts I & II, was conceived first. Everything else keys into that piece. The mural was designed shortly after the diptych. It is essentially a wire-frame version of the diptych, for which I went back into the files for the paintings, selected shapes and outlined them, removing all of the high-key color and using only warm and cool grey tones. The mural isn’t inclusive of every shape in the painting. I see it as a suggestion, a diagram or a map. I’ve never done a mural until now, so a big part of the process was figuring out a means of production. We used vinyl masking to paint the mural, in five complete and separate layers; every little glitchy pixel is captured in the image, whereas the in my paintings, the imagery is more refined by the hand. I knew I wanted to make a sculptural piece. Again, so much of the process was determining how these fragments would be made. I carved forms out of styrofoam, keeping them similar to the forms in the paintings. I had silicone molds made, and my assistant and I did all of the encaustic casting in the studio. The mural was produced on-site. The diptych took many months to complete, and all the while, we were also casting forms for Variation: Artifacts. 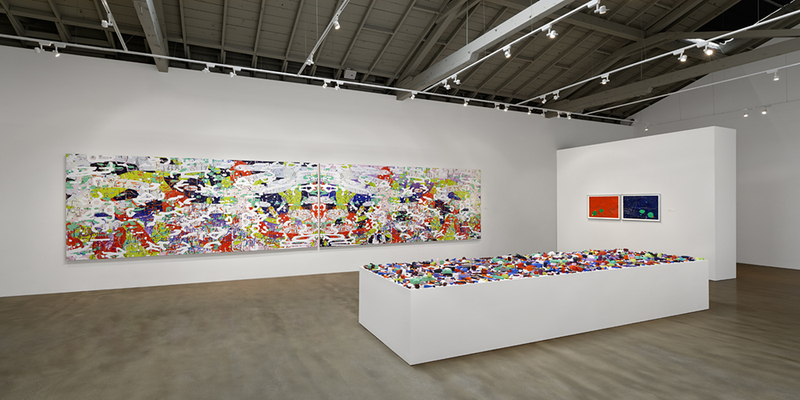 The smaller pieces in the exhibition were completed during the final months of production. For many years I have created groups of closely related paintings for exhibitions. Until now, the progression was more literal in a sense. For this show, I wanted to tease out particular qualities, elements, characteristics in a more fragmented way. The diptych is the “mothership.” Everything else relates to it, but in a more exploratory way. As the work progressed, I felt that a creative cosmology of sorts was developing. In a sense, one could deduce that anything in the room might be the seed of the large diptych. One might conclude that the diptych is the ultimate crescendo, all of the pieces coming together. But in fact, Variation: Apparent Reflectional Symmetry, Parts I & II is the beginning point; everything else is a deconstruction of that piece. MRK: You’ve explained that you have work that is based on what you’ve termed a “hermetic” language. Does that refer to each series or to your works as a whole? AE: It refers to the whole of my work. Most of the forms and shapes appear again and again. The language of forms was initially rendered in Illustrator. It is a very simple vocabulary: straight lines, curved lines, an oblong form, as well as the repetition of these forms into grids. In earlier works, the geometry was quite intact. Recently, it is all but lost. But the DNA of the work never changes. It merely manifests in different ways. The basic forms are further manipulated in Photoshop. They are stretched, nudged, pulled, scaled, etc. Sections are erased. Pixels are added or subtracted, shapes are outlined, etc. When I arrive at something interesting, I will often use it dozens of times, in many paintings, over a period of years. At a certain point, I began to feel that these forms took on a larger presence: they have become personal gestures in a strange way, even though they were originally conceived via keystrokes rather than the hand. There are many procedural steps and points of translation between the digital rendering and the final painting. There are varying degrees of both digital and material mediation, throughout the labor-intensive process of making a painting. I feel that the imagery is imbued with some power along the way, via the investment of time, attention and physical energy, belying the humble beginnings of the digital imagery. So, the language is hermetic, in that it is essentially and absolutely a self-referential system, with each part of the image related to every other part of the image in a very literal way. Further, it has become very personal and idiosyncratic, even though the means of devising it is seemingly impersonal. MRK: Do you consider sets of works to be worlds unto themselves, or are they pieces of a larger abstract world that you are constructing? Both. There is a connectedness throughout all of the work. When I start a new body of work for an exhibition, I will open a bunch of old files, and start grabbing layers out of them, laying them down into new files. It’s an organic process. But I also see each body of work/exhibition as a contained system. In fact, it is a little difficult for me to make a painting that isn’t part of a larger context. I’m making a couple of new paintings now, for an art fair later this summer, and they feel rather orphaned. They’ll go off on their own, without the context of a particular exhibition space, without a full complement of companions. I don’t do this very often. It disrupts my sense of the work. 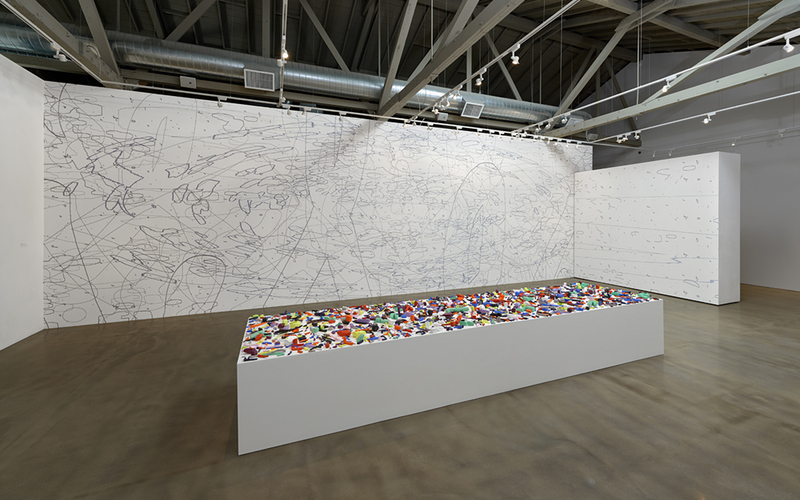 MRK: How does encaustic inform your process of translating the digitally composed lines into the physical? What role does transparency play in your work? AE: The clear encaustic layer that covers the oil underpainting acts as windowpane in sense, like a glaze in an oil painting. There is a “looking through” that happens. The background is pushed back and it is unified. The top shapes, which are pigmented wax, are really the ultimate manifestations of the other forms–they have pushed up through the surface, asserting themselves with edges and dimensionality and texture. They create subtle shadows. They have a different kind of presence. In the earlier works that were comprised of intact geometric compositions, transparency was perhaps more important, but it is still very much in play. One of the most challenging aspects of making the paintings is managing the transparency of each layer. If it is “off” it really changes everything. And then one must evaluate and perhaps compensate. MRK: I’ve read that the history of painting plays a large part in the concepts that you spend time investigating. Do you have in mind to be in conversation with certain artists (or artworks or art movements) of the past, or is that something you see taking place once your works are created? 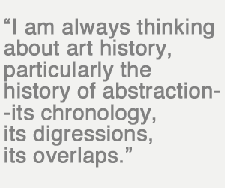 AE: I am always thinking about art history, particularly the history of abstraction–its chronology, its digressions, its overlaps. There are artists that are in my mind all of the time, such as Pollock, Mitchell, Al Held, Bridget Riley, Jonathan Lasker, among others. Of course, some of it is more apparent after the fact. Sometimes we don’t realize how deeply embedded our influences are. MRK: You’ve moved away from abstracting appropriated material, and the digital rendering mitigates your gestural interaction with line. Now having removed the human hand in the development of the line(s), has computer manipulation allowed you to achieve essential abstraction? AE: That’s an interesting question. My raw imagery has no “hand” in it, but some of it is actually pretty rough and unkempt. The way in which I paint the forms is neutral and precise, not expressive. But I think (hope) the overall effect is one of the hand trying to be perfect, more perfect than the the digital, more mediated by processes and materials, more real, more human. I strive for a more pure or essential abstraction. I decided to create a vernacular of rather meaningless, noisy imagery, and I try to make it into something bigger, through accretion, repetition, accumulation, processes, materiality and scale. Through time and labor. I have issues with a lot of abstraction today; though I might like it in a visual sense, there is a lot of painting that loosely ties itself to a subject although the subject might not be apparent or even very significant. I won’t name names… The larger question is: how do we deal with dead ends? 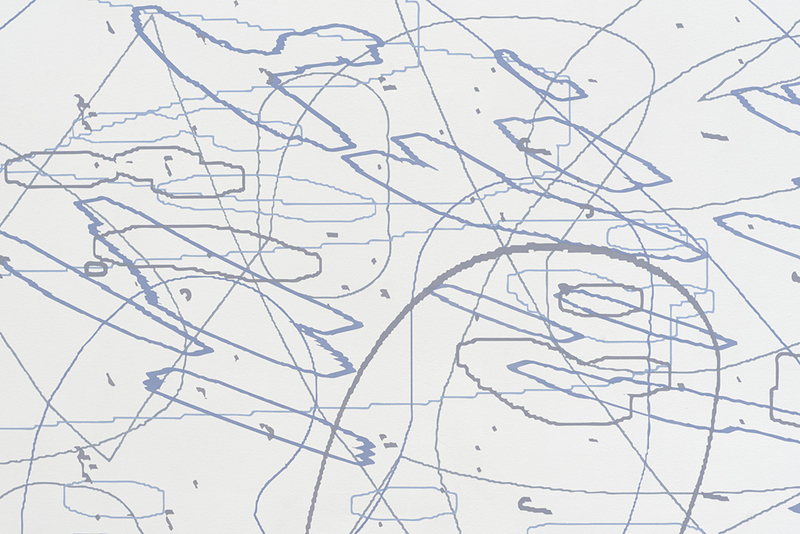 Okay, so Abstract Expressionism is over. What do we do about that? Can we still be in dialogue with the movement? It was a point in the continuum. I just want to be a participant in that ongoing dialogue. Amy Ellingson’s paintings have been exhibited nationally. She is the recipient of the 2009 Fleishhacker Foundation Eureka Fellowship and the 1999 Artadia Grant to Individual Artists and has been awarded fellowships at the MacDowell Colony, the Ucross Foundation, and the Civitella Ranieri Foundation. 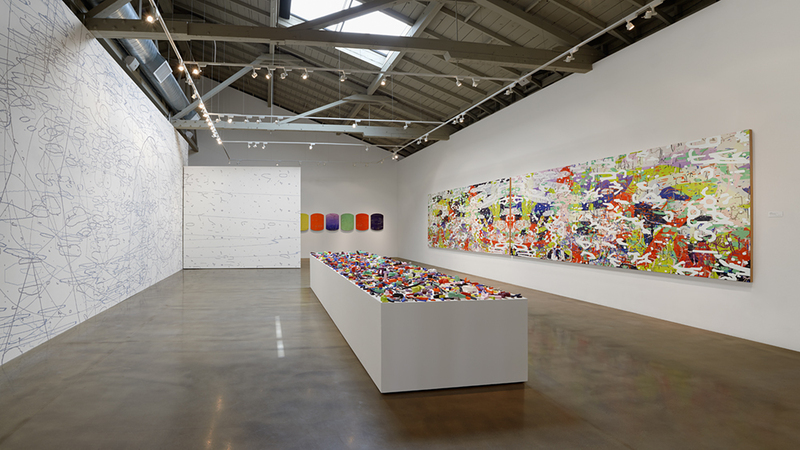 Notable group exhibitions include Bay Area Now 3 at Yerba Buena Center for the Arts; Neo Mod: Recent Northern California Abstraction at the Crocker Art Museum; and Nineteen Going on Twenty: Recent Acquisitions from the Collection at The Contemporary Museum, Honolulu. Her work is held in various public and corporate collections, including the Crocker Art Museum, the San Jose Museum of Art, the Oakland Museum of California, the Berkeley Art Museum and the Achenbach Foundation for Graphic Arts. Ellingson’s paintings have been reviewed in numerous publications, including the New York Times, Chicago Tribune, San Francisco Chronicle, NYArts Magazine, and Art issues. She received a B.A. in Studio Art from Scripps College and an M.F.A. from CalArts, and was Associate Professor of Art at the San Francisco Art Institute from 2000 to 2011. She is currently working on a permanent large-scale public commission for the San Francisco International Airport, due to open July 2015. Amy Ellingson lives and works in San Francisco. Great interview, Maritza! So interesting to read, and the way your questions led AE to verbally deconstruct her process seemed to add one more layer to the overall installation.